One of the best online casinos to play slots currently is Royal Panda Casino. Royal Panda accepts players form the UK and from most countries of the EU too. 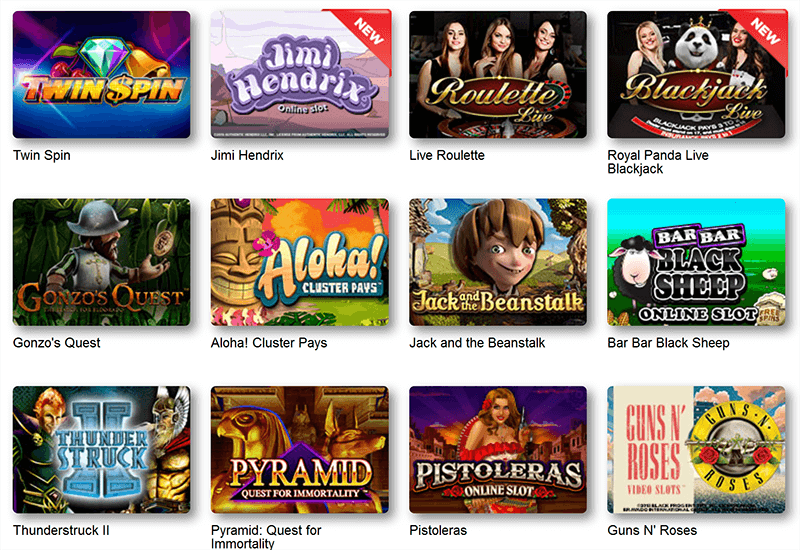 They offer a relatively large collection of video slots and classic fruit machines. Playing other casino games like roulette, blackjack and video-poker is possible too, as well as a fairly good amount of live casino games such as live baccarat, live roulette and poker games. Most of the slots that are populare right now can be fount at Royal Panda. We’re talking about games such as Starburst, Mega Moolah, Twin Spin, Gonzo’s Quest and Mötorhead. Playing is fast and easy, and can be done in the free demo mode or for real money. In the Free mode you get to play the game with free credits only, allowing you to safely explore the fruit machine before you decide to insert real coins and start playing for winnings. The “Play for Real Mode” requires you to register at the casino, which is safe and easy. Royal Panda guarantees your privacy and no downloads are required to play any of the games. As a new player, you receive a welcome bonus consisting of 10 free spins on one of the current slot machines. The only thing you need to do is register, no deposits are required. The other part of the welcome offer is a first deposit bonus up to £100. That means free extra money on top of the amount that you deposit to play with. So if your first deposit is £100, your extra bonus is an additional £100, making your grand total a £200 amount to play slots and other casino games. *Please be advised that registering and playing at Royal Panda is 18+. It’s important to know that the welcome bonus applies to the first deposit only. In order to receive the Casino bonus, a minimum deposit of £10 is required and a max. of £100. Regarding to the Bonus and the free spins, the winnings wagering requirement is x35.